I was recently bowled over by the simple beauty and elegance of a beetroot tart I saw created on ‘Kew on a Plate’ by Raymond Blanc; it looked so pretty, like a simple daisy flower. And not only were the colours vivid and beautiful, it looked easy to assemble too. I just knew I had to recreate the aesthetics of the tart but with flavours liked by our taste buds. The original tart was made with puff pastry encasing an onion type chutney which was topped with thinly sliced red beetroot. Unfortunately Mr E doesn’t overly care for beetroot and although he likes onions, they don’t like him! So we popped our thinking caps on in an effort to come up with something aesthetically pleasing, but still tasty and nutritious. Carrots were the obvious answer for the top, being circular, beautifully coloured and naturally sweet. For the filling, we opted for pulverised butterbeans, knowing that carrots and butterbeans sit well together. I also decided to use a wholemeal short pastry, because although pastry isn’t the healthiest thing in the world, wholemeal short crust pastry is certainly healthier than puff! And a tons easier to make, though of course it can be bought! 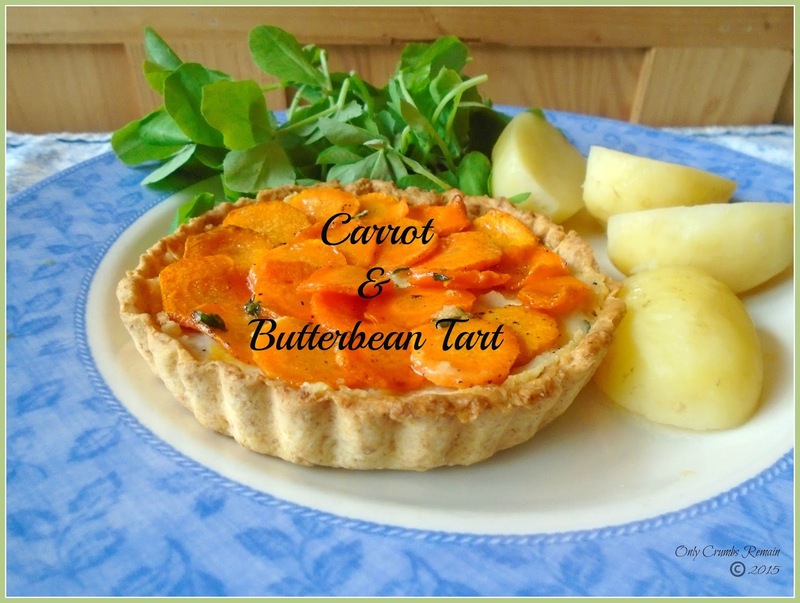 The result was a really flavoursome tart with the addition of the thyme which works well with both carrots and butterbeans. I was happy with the aesthetic outcome, (for a first attempt, though it’s obviously not to Raymond Blancs precision) after all it was that which drew me to Raymond Blanc’s tart in the first place. It’s not perfect and I think when we make it again I’ll be more carful when applying the glaze as the carrot wanted to move a little from the motion of the pastry brush. But overall I was happy; and it was eaten happily by myself and Mr E when served with new potatoes and salad. It certainly hit the mark on the flavour front also! I found I had a little too much of the butterbean mixture for my tarts, the remnants being used as a snack eaten with vegetable crudités. And don’t forget to save that water from the butterbeans. You can make all manner of things with that unassuming water (Aquafaba), meringues, macaroons, mousse, pasta all without the need for an egg! Time: hands on time 25 minutes; plus 25 – 30 minutes bake time. 1. Make the pastry and chill it. Place the flours, salt and cubed chilled butter into a bowl. Rub the fat and flour between your thumb and fingertips until the mixture resembles breadcrumbs. Add a little water and, using a knife, cut through the mixture to combine. Gradually add a little more water, enough to bring the dough together. Gently shape the dough into a disc, wrap in cling film and place in the fridge to chill. 2. Make the butterbean filling. Place the drained beans, into a small pan with the lemon zest, thyme, seasoning and water. Heat through on the hob. Using either a hand held stick blender or food processor, blitz the mixture until it is as smooth as you’d like. Taste, adjusting the seasoning as necessary. Mix in a little more water if you feel the mixture is a little too thick. Set aside. 4. Line the tart cases and bake blind. Roll out the pastry on a lightly floured work surface, fairly thinly. Line the tart cases, easing the pastry into the edges of the case. Trim off the excess pastry. Lightly prick the bottom of the pastry cases with a fork. Line the pastry cases with greaseproof paper weighted down with baking beans or similar. Place the tart cases on a baking tray and bake in the oven for 10 minutes. Remove the baking beans and greaseproof paper. Rotate the baking tray and place the tarts back in the oven for a further 5 – 8 minutes until the pastry is golden and cooked through. 5. Prepare the carrot. Heat the butter in a frying pan over a medium heat. Place a single layer of carrots in the frying pan and cook for 3 – 5 minutes until softened and lightly colouring. Remove the carrots and place glazed side uppermost on a sheet of absorbent kitchen roll. You may need to cook the carrots in batches. 6. Preheat the oven to 180c / 160 Fan / Gas 4 when you’re getting ready to eat. 7. Assemble the tart. Assemble the tart before you are ready to eat. Place some of the butterbean mixture in the bottom of each tart case, smoothing out, until they are almost full. Lay the carrots, glazed side uppermost, on top of the butterbean mixture, starting from the edge of the tart case and overlapping each carrot with the next. 8. Heat through. Place the tarts into the oven to heat through for 10 – 15 minutes. 9. Glaze the carrots. Just before the tarts are removed from the oven, place the butter and thyme in a small pan and set it over a medium heat for the butter to melt. With the melted butter infused with the thyme leaves, use a pastry brush to carefully glaze the carrots. Thank you Jenny. I was just so taken by Raymond Blanc's tart that I knew I had to try something similar. It was really tasty and made a lovely change. Aquafaba is just fabulous, you'll have to pop it onto your 'to make' list. This looks so tasty – you rarely see such a colourful looking tart. It's beautiful! Thank you Mandy, the butterbeans made a lovely change. They made a great base to carry other flavours like the thyme, though I wouldn't skimp on the seasoning. Aquafaba (the bean water) is just amazing, you'll have to give it a whirl! Thank you Hayley. The carrot just sing out with their vibrant colour.